Both Sand Dollar Estate and Little Sand Dollar are fully air-conditioned and furnished to exceptional standards. 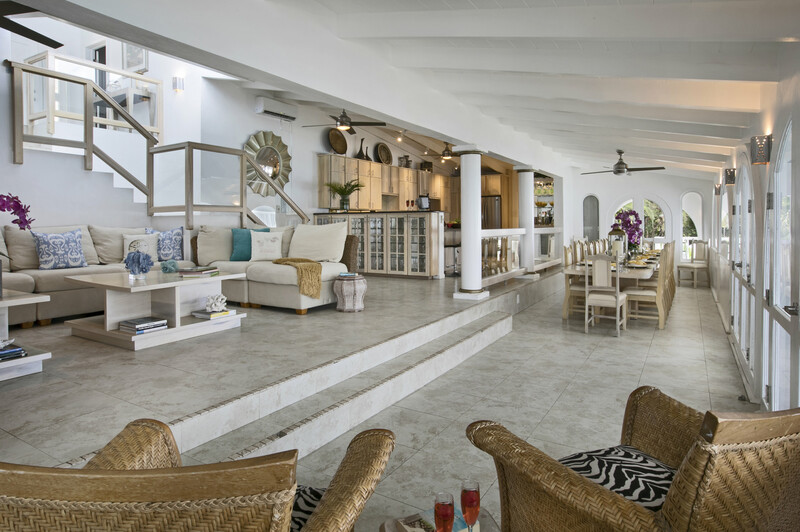 The interiors offer beautiful marble floors and a tasteful blend of contemporary and island decor. Soothing shades of taupe woods, creamy yellows and soft pastels provide a relaxing environment. 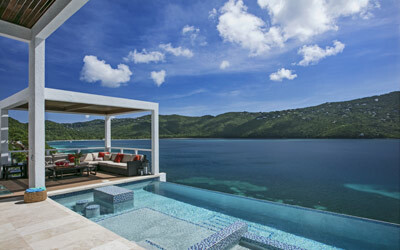 Full length windows capitalize on spectacular views of the blue waters of Magen's Bay - and the villa's private white sand beach. 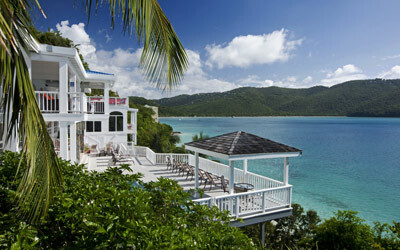 Sand Dollar is the estate's larger villa property and it is built on several levels. (View villa floor plans layout) The upper level opens to two expansive king bedroom suites each with its own large bath and deck with outdoor shower. Each has a separate alcove with sofabed perfect for young children. Steps lead to the main level which offers a gourmet kitchen with granite countertops, two stoves and high end appliances. Also on this level is an office with wireless printer, modem, and computer, a spacious living area with a huge flat-screen TV and surround sound, and a third bedroom with king size bed and full bath. The main level opens to a spacious deck. A short flight of stairs leads down to the generous pool level and to three more air conditioned bedroom suites, each with its own full bath and sitting area. This lower level of bedroom suites works well for families with young children, as all suites are built around a common gaming area. For that special vacation or occasion (wedding, family reunion or business retreat) why stay at a St. Thomas hotel when you can experience the vacation of a lifetime at the exquisite Sand Dollar Estate!